According to the yoga sutras (1.31 – 1.32), irregularities of the breath is one of the obstacles that we seek to overcome throughout yoga practice. By practicing Pranayama (prana= life breath, yama=control) we are able to overcome these irregularities. Breath work brings many valuable benefits to our overall health. A a conscious practice of proper breathing calms the nervous system, reduces blood pressure, relaxes the body, and increases oxygen to the organs. By consciously focusing on the breath we can quiet the mind and improve concentration. There are a multitude of pranayama practices in yoga: Nadi Shodhanam, Bhastrika, Kapalabhati, Ujjayi, etc. Each practice brings it’s own benefit, from quieting the mind for meditation to increasing the heat in the body to cleansing the body of toxins. However, what we want to focus on before moving into any of these practices is the basic step of retraining ourselves to breath properly. Once we can connect to the diaphragmatic breath, we can move onto some of the more advanced breathing exercises. Have you ever watched a newborn baby breathe? When we are born our breath is naturally a diaphragmatic breath. We have not yet experienced the day to day stresses this life puts upon us making us hold our breath and retain tension in our autonomic nervous system. At a very young age we begin to lose the innate ability to breath deeply. The breath moves high into the chest, we suspend the breath (either in or out) and engage in a constant “Fight or flight” reactionary breath, unwittingly keeping ourselves in a constant state of stress. We have forgotten to breath and therefore need to retrain our system. In order to do this we need to start at the very beginning, teach ourselves to breath as we did when we were infants. Reconnecting with the movement of the diaphragm, acknowledging what is happening with our breath and learning to deepen and even out our breath until it becomes as natural as it was when we were born. Diaphragmatic breathing is the practice of using the diaphragm with consciousness. As you inhale the diaphragm drops, gently pressing into the organs of the lower torso. As you exhale the diagram contracts and presses the air out of the lungs. We first practice this in an exaggerated fashion, letting the belly expand on the inhale and pull in on the exhale, but once we can connect back to the natural breath the movement of the lower abdominal muscles decreases to the point of a gentle rise and fall. An additional behavior to take notice of is if you are breathing through your mouth or through your nose or some combination of both. Our nose is built to be our first line of defense for our immune system, the book The Science of Breath, does an excellent job describing the function of the nose. 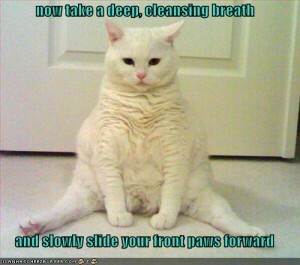 So let the breath move only through the nose when you are practicing the diaphragmatic breath. Take this practice with you throughout your day, check in with your breath on a regular basis, notice if you are holding the breath (in or out) and remind yourself to breathe. Notice if you hold your breath in stressful situations and if consciously breathing helps your stress level decrease. And bring this practice to the mat. Notice how you are breathing throughout your yoga practice and if you can keep the breath steady and even. The breath is the keystone that moves us from the physical body to mental awareness. It is the best tool you have to strengthen concentration and mindfulness and to begin moving through the last four limbs of yoga. Join us next time as we move into Pratyahara – Withdrawal of the Senses.